The price of gold built on recent gains on Monday as safe-haven buyers returned to the market on growing fears of a ratcheting up of violence in Ukraine and the threat of a European "gas war". On the Comex division of the New York Mercantile Exchange, gold futures for June delivery in late afternoon trade exchanged hands for $1,327.50 an ounce, up $8.50 from Friday's close. Gold is now the highest in almost four weeks and is up nearly 11% since the start of the year. Gold was supported by investors seeking the relative safety of gold as a hard asset after news of renewed clashes between security forces and pro-Russian activists in the east of the country. The government in Kiev on Monday called for the deployment of United Nations peacekeeping troops as part of its "anti-terrorist" actions in ten cities where official buildings have been occupied by protestors demanding greater regional autonomy. Russia has demanded that Ukraine does nothing to inflame tensions and stepped up its propaganda war, although many in the West suspect that Moscow's strategy is to weaken Ukraine’s new government to prevent the country from integrating with the EU. Russia is a major supplier of gas to Europe – 40% of it in the case of Germany – with a significant portion of it via pipelines that run through Ukraine. Last week Russia warned it may start cutting off supplies to Ukraine over unpaid bills of some $2 billion. European natural gas prices have been rising steadily since the crisis began, but analysts point out that the use of gas supplies in the stand-off may end up hurting Russia more in the long term as its European customers look elsewhere for supplies. The EU has been considering tougher economic sanctions against Russia but at a Luxembourg meeting on Monday foreign ministers did not impose any punitive measures on Moscow. UK oil major BP talked of repercussion if the relationship with the Kremlin should deteriorate further pointing to its 20% stake in state-owned oil company Rosneft. Inside Ukraine the economic crisis deepened on Monday with the country's central bank lifting benchmark interest rates by 3% to 9.5% to support the falling currency, the hryvnia, and fight inflation. The Ukraine central bank also warned that foreign exchange reserves have fallen to barely two months’ import cover. 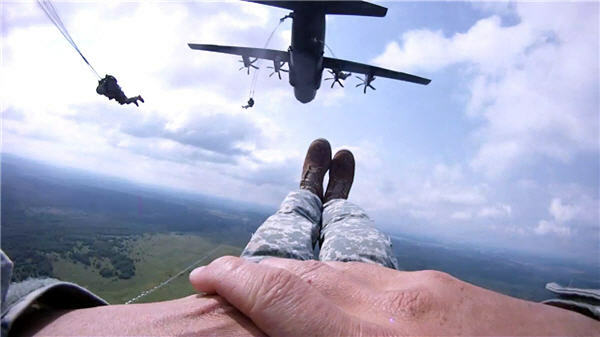 Image is from US Army Europe: Paratrooper from 173rd Airborne Brigade during Rapid Trident military exercises over Ukraine in 2011.